Some people derogatively claim that evolution is "just a theory," as if it were a fanciful idea that may be accepted or disregarded based on personal taste. But as science well knows, to say that an idea is "just a theory" is actually to pay it a great tribute! 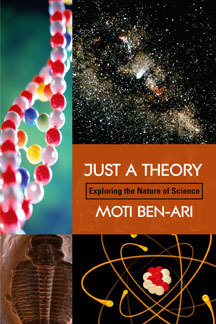 Just a Theory is an overview of the modern conception of the nature of science that will enable readers to distinguish the claims of science from the claims of pseudosciences such as creationism and astrology (which illegitimately wrap themselves in the mantle of science). With a light (even humorous) tone and a text that is easy to read, readers are invited to explore the key concepts of the nature of science. Of particular interest is the analysis of the core terms of science (fact, law, proof, and theory) in relation to the vastly different, colloquial meanings often given to these terms by nonscientists. Real theories must be supported by evidence, not opinions, beliefs, and personal experiences, however convincing they may be. The chapters end with biographical vignettes of selected scientistsï¿½some will be familiar to all readers while others are less so though they are no less significant. While sharing a common commitment to the enterprise of science and persistence in overcoming obstacles, they exhibit a diversity of background and personality. This accessible, informative, and comprehensive work will give curious readers a good grasp of what real science is, as well as a better understanding of why so many of the claims we hear and read about everyday fall far short of being "just a theory." Review by David Ludden. Skeptic 12(3), 2006, 78-79.
Review by Andreas Quale. Science in School 9, 2008, 76.
Review by Michael Zimmerman. Reports of the National Center for Science Education 27(5-6), 2007, 46-47.